Our Meadow plan offers an upgrade to a coffin made of Bamboo, one of the fastest growing and most sustainable crops in the world. The plan also includes the provision of a chapel of rest for family and friends to visit and a limousine for transport to and from the service. All of our green plans include the cost of completely offsetting the carbon footprint of your funeral service by tree planting in conservation areas or by donating funds to preserve endangered rain forests around the world. In addition Golden Leaves contributes on your behalf to an environmental fund that combats climate change for the benefit of future generations. You also have the choice of 3 Natural Memorials. These plans do NOT include any funds to cover third party costs* such as Crematorium or Cemetery fees, Clergy or Church fees. Should you wish to contribute towards these costs, please call us free on 0800 85 44 48 and we will recommend suitable level of cover. 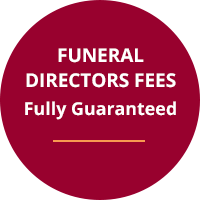 Any sum paid towards these costs are guaranteed to be met in line with any increase in the Retail Price Index (RPI), but may require an additional top-up payment from your estate if this has been exceeded at the time of the funeral.